Vikram.A.Sarabhai Indian scientists,The establishment of the Indian Space Research Organization (ISRO) was one of Sarabhai`s greatest achievements.Vikram Ambalal Sarabhai, considered the "Father of the Indian space programme"
"There are some who question the relevance of space activities in a developing nation. To us, there is no ambiguity of purpose. We do not have the fantasy of competing with the economically advanced nations in the exploration of the moon or the planets or manned space-flight. 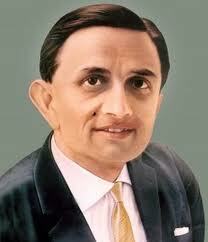 Vikram Ambalal Sarabhai, considered the "Father of the Indian space programme", was born into a privileged family in Ahmedabad on 12 August 1919. His early education took place at a private school run on Montessori lines which encouraged scientific curiosity and creativity. Further educated at the Gujarat College in his home town, he distinguished himself in the study of science and was amongst only a handful of his fellow nationals who were awarded places to pursue their studies abroad. In 1937, he left for England and studied Physics at St John`s College, Cambridge where he received his undergraduate tripods degree in 1940. With the Second World War now taking place in Europe, he returned home and at the Indian Institute of Science in Bangalore became a research scholar on the effects of cosmic rays. Here he was under the under the tutelage of Nobel laureate, Dr C. V. Raman. His enthusiasm for studies of the Sun led him to set up observatories in Bangalore, Poona and in the Himalayas. Once the war was over, he returned to England briefly and was awarded a PhD. by Cambridge University for the pioneering work he had undertaken in his chosen field. In 1947, alongside a meteorologist, K. R. Ramanathan, he helped to establish the Physical Research Laboratory. It initially consisted of borrowed rooms in the Science Institute of the Ahmedabad Education Society, where the two scientists set up teams studying both cosmic rays and atmospheric physics. Sarabhai`s team discovered that weather conditions alone could not explain the observed variations in the strength of cosmic rays - they had therefore to be related to variations in solar activity. He and his team were thus pioneers in the new discipline of Solar Physics. With the Indian government recognising this scientific breakthrough, financial support was given to Sarabhai from the Indian Council of Scientific and Industrial Research and the Department of Atomic Energy. Sarabhai was given the task of organising the Indian programme for the International Geophysical Year of 1957. With the launch of Sputnik-1 by the Soviet Union in the same year, it was decided to create the Indian National Committee for Space Research. Sarabhai became Chairman. With support from Homi Bhabha from the Atomic Energy Commission, Sarabhai set up India`s first rocket launching station, TERLS, in Thumba on the coast of the Arabian Sea. The first launch took place on 21 November 1963. Once the successful inaugural launch had taken place, the facilities at Thumba were expanded. After the sudden death of Homi Bhabha, Sarabhai was appointed as Chairman of the Indian Atomic Energy Commission in 1966. Meanwhile, the Physical Research Laboratory was expanded to become the headquarters for the Indian Space Programme and an experimental Satellite Communication Earth Station was also established at Ahmedabad. The establishment of the Indian Space Research Organization (ISRO) was one of Sarabhai`s greatest achievements. He convinced the government of the importance of a space programme for a developing country like India. In his opinion, developing countries should acquire competence in high technology for the solution of their particular problems based on an evaluation of their resources. At the age of 52, Sarabhai passed away in his sleep on 31 December 1971. Sarabhai first initiated the manufacturing and launch of an Indian Satellite and posthumously, Aryabhata I was launched into orbit in 1975 from the Soviet Union`s Cosmodrome at Baikanur. During 1975-1976, India launched the Satellite Instructional Television Experiment (SITE), which was the result of negotiation between Sarabhai and NASA. The Vikram Sarabhai Space Centre, a research institute specialising in solid and liquid propellants for rockets located in the southern Indian city of Trivandrum is named in his memory.